Chinese food is a naturally quick fast food, even if you don’t buy it from the local takeaway! A lot of Chinese food is stir fried so that it cooks quickly in a wok, and the only reason that most westernised Chinese dishes are so loaded with fat and calories is that the oil used over here tends to get soaked up in the rice and cause it to expand in both! We also tend to like the meatier dishes in the UK – special fried rice and meat fried rice, plus dishes that are often deep fried in batter and served with high calorie sauces. With a little tinkering, you can create a quick Chinese feast of your own, and you won’t need to trouble the local dial-a-Chinese either. Special fried rice is a definite Chinese takeaway treat, but in reality it’s so quick and easy to make your own healthy version. The beauty of this recipe is that it can so easily be adapted to take into account any ingredients that you dislike, or anything you want to add. You can add chilli powder if you prefer a spicier rice too. Boil the rice in a pan until it’s just about tender (al dente) and then rinse it in cold water. Spray a wok or a non stick frying pan with the cooking spray and then add the onions, mushrooms and garlic. Cook for a few minutes and then add the beaten egg, stirring it fast until it clumps together. Add the rest of the ingredients and then stir fry on a high heat for three or four minutes until all the ingredients are heated through. Everyone loves crispy duck pancakes but delicious as they are, duck can be a very fatty meat. This quick, healthy alternative uses pork or chicken instead and is just as tasty. Make up the marinade in a large bowl and add the meat slices. Cover the bowl and leave in the fridge for twenty minutes. Heat up a wok or a non stick frying pan, take the meat out of the marinade (keep it to one side) and add that to the pan. Stir fry until the meat has browned all over. Add the rest of the marinade and stir fry quickly for a few minutes. Add the cucumber and spring onions and serve with pancakes. Chinese Lemon Chicken is a firm favourite, but can be fatty as it’s usually served in batter – not to mention the sweet, syrupy sauce. Make a quick and healthy version instead. Make the lemon sauce first by adding all the ingredients to a pan and bringing to the boil. Stir the sauce continuously and simmer it until it thickens. Cut the chicken in to strips, and coat in the corn flour. Whisk the egg white, and then dip the chicken in to the egg. 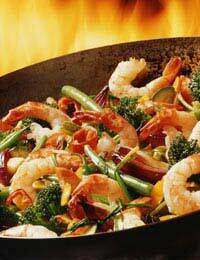 Drop each piece in to a wok coated with hot oil and stir fry until browned and cooked right through. Serve with the sauce and special fried rice for a delicious and healthy Chinese meal. Thanks Coco. We believe most people would have a good proportion of the things in these recipes in their fridge, freezer or store cupboard. Hoisin and soy sauce are the ones that you may not have, but bottles of these will last a long time once you've got them in. The chinese pancakes can be bought frozen so you could buy a few and just get them out whenever you feel like a chinese. You can actually make your own chinese pancakes by blending some cooked rice with a beaten egg. If you pour small amounts into a frying pan with heated sunflower oil they will form into pancakes. Cook them until they're brown and then turn over.